Cette unité a une vue magnifique sur le port. Cuisine bien équipée et unité bien entretenue. Très grande terrasse qui serait idéal pour se détendre ou un barbecue avec vos amis. Sandpiper Cove, une station de 43 acres, a 1100 pieds de plages de sable blanc qui se reposent contre le golfe du Mexique. Les installations comprennent un parcours de golf 9 trous par 3, tennis, shuffle board, des chaussures de cheval, des quais de bateau, 3 bains à remous, 5 piscines, et des barbecues dispersés dans tout le complexe pour votre commodité. Des quais de bateau peuvent être loués moyennant des frais supplémentaires. Situé au centre de Sandpiper Cove, il vous permet d'accéder rapidement à toutes les commodités. I've stayed at Sandpiper Cove many, many times. Most of the time in a family unit or through VRBO. This particular stay was through Holidy Isle Properties which should not really make a difference. The unit was a 3 BR, 1st floor with a very large deck that over looked the beautiful harbor. It was located right next to the Laniappe and within a short distance to the pool and beach. Great location. However, the unit itself was clean but very rough. A few light bulbs out, broken pieces of tile in the shower, tile pulling away from the walls in the bathrooms that had what looked like mold in the cracks. Bedding had tears in it, carpet definitely needed replaced, washer/ dryer sliding door track was hanging from the ceiling, batteries corroded in the BR remote, deck furniture cushions were well worn, floors very unlevel with cracked tile throughout. The front door lock is not a very secure lock...only a knob lock. I feel like this unit needs a ton...a ton of TLC. I can't believe someone would own in such a nice complex and let their unit go like that. I will not rent this one again. Unit 6100 is a great place to spend your vacation days. It's nicely furnished, whether it fits your taste or not. 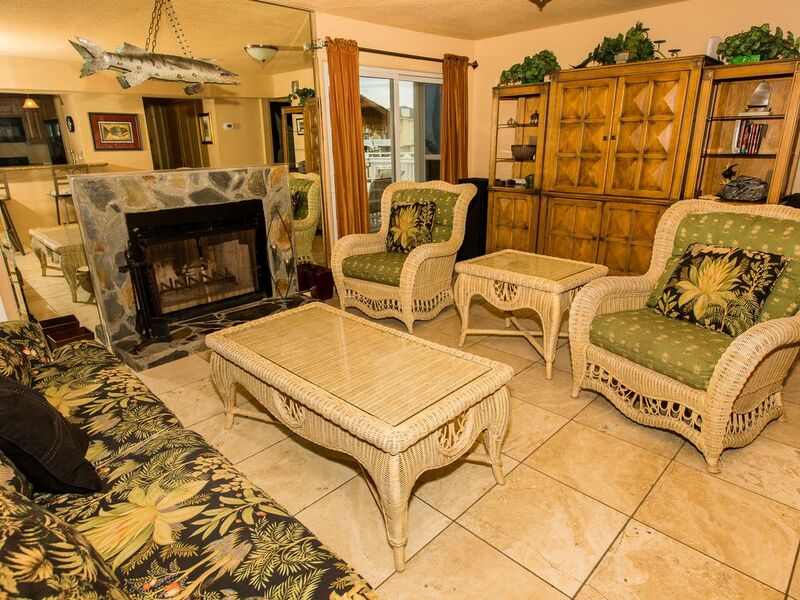 It's very close to the beach (5 minute walk) and one of the property pools. Even though there is a 4-lane street to cross, it's very safe because it has a button-triggered light for pedestrians. It has 3 bedrooms, and a sofa-bed. We were a total of 8, including two kids. The kids ended up sharing beds with the adults, so we never used the sofa-bed. Fully equipped kitchen (fridge/freezer, stove, oven, microwave, coffee brewer), so you can take full advantage of it after a visit to the supermarket (Winn-Dixie on the opposite block and Wal-Mart 2 miles away). There is a washer and dryer inside the unit. It has two full bathrooms, with one of them having the toilet and shower behind an additional door. The view of the marina from the deck is great. Nice place for breakfast outside. While this didn't affect us, be aware that even though the unit is on a first floor, there is a set of (about 8) steps to get to the entrance door. If you need special access, you may need to find a different unit. There had been a leak from the upper unit that damaged one of the bathroom ceilings, and it had been hastily repaired. The plumber came to look at it at 7am one morning. I think this could have been handled better by a) disclosing the damage in advance, and b) scheduling the plumber visit when the unit was not occupied. One star removed. The condo property this unit is part of has multiple pools, tennis courts, and a (small, and well maintained) 9-hole course. Loaner golf clubs and balls are available at the office. The property is located in a very convenient city area where there's all kinds of things to do aside from beach activities (amusement parks, restaurants, souvenir stores, chain stores). The Louisianna Lagniappe Restaurant is literallly next door to the unit. We didn't try that restaurant, though. We had such a good time we decided to stay an extra day, which the office accommodated very easily, at the same rate. (BTW, this proves the plumber could have been scheduled to visit after our original stay plans).